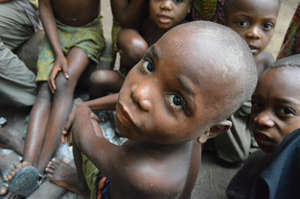 Tribal children in the African rainforests have been paid in glue to sniff, and alcohol, in return for menial work, a new Survival International report has revealed. The report found instances of market traders in the Republic of Congo plying children from the Bayaka tribe with glue in 2013, in exchange for cleaning out latrines. In Cameroon Baka tribespeople, illegally evicted from their forest homes, are often paid in five glasses of moonshine in exchange for half a day’s manual labor. A combination of poverty and depression caused by the theft of their land forces many to turn to heavy drinking as an escape from their troubles. Across much of central Africa, dispossessed hunter-gatherer peoples are frequently paid in addictive substances, most commonly home-brewed alcohol. Problems of addiction and substance abuse are common among tribes who have had their land stolen from them. In Canada, alienated Innu children whose people were forced to abandon their nomadic way of life turn to sniffing gas from plastic bags. Likewise in Australia, rates of alcoholism among Aboriginal people are higher than among the wider population. Drug addiction and alcoholism are not inevitable for tribal peoples. They are the result of failed policy, imposing “progress” and “development” on peoples who are otherwise largely self-sufficient. Industrialized societies subject tribal peoples to genocidal violence, slavery and racism so they can steal their lands, resources and labor. These crimes are often carried out in the name of progress and development. This article was posted on Friday, January 22nd, 2016 at 7:00am and is filed under Australia, Cameroon, Canada, Capitalism, Children/Youth, Colonialism, Crime, Democratic Rep. Congo, Original Peoples.